December 04, 2017 – AccuWeather reports following a mild weekend in the midwestern United States, this week’s snowstorm and arctic blast will be a rude awakening. A storm sweeping across the Plains will slam areas from Little Rock, Arkansas, to near Chicago with potentially heavy thunderstorms, leading to localized wind damage and flooding. A couple of the strongest thunderstorms may produce a tornado as well. While these storms could cause problems along major highways in the area, as well as airline delays, the weather on the other side of the storm is expected to be more disruptive. Dry and mild conditions will be swiftly replaced by chilly and snowy ones across the Dakotas and much of Minnesota. Periods of rain will pester those in southeastern Minnesota, Wisconsin and Michigan. Increasing winds will further worsen the situation for motorists by creating dangerous blizzard conditions for a time Monday night. Travel may become very difficult to nearly impossible at times as visibility is reduced to near zero. Officials may be forced to close roads, including I-29 in North Dakota. Minneapolis, caught at the intersection of the wet and wintry weather, will experience a changeover over to snow Monday night. The dramatic cool down will freeze rain and snow on roads and sidewalks, making travel dangerous. A similarly treacherous temperature drop is expected in Sioux Falls, South Dakota. The storm is expected to move out of these areas on Monday night, leaving enough snow to shovel and plow in its wake. Up to 3 inches of snow can be anticipated throughout much of the Dakotas and central Minnesota, including Minneapolis. 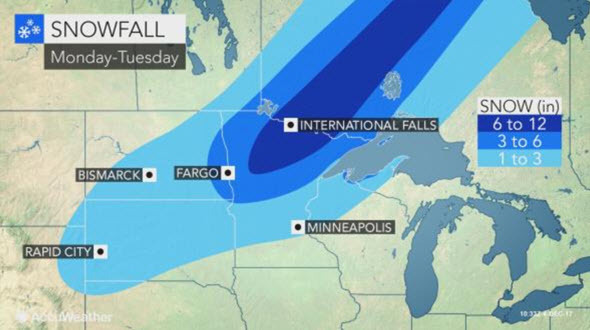 Up to a foot could accumulate in eastern North Dakota and northern Minnesota with higher amounts expected around International Falls before snow ends on Tuesday. The howling winds creating the blizzard conditions will make the snow difficult to measure with higher drifts anticipated in some locations. The winds, however, can impact a much larger area of the North Central states than where snow will fall. 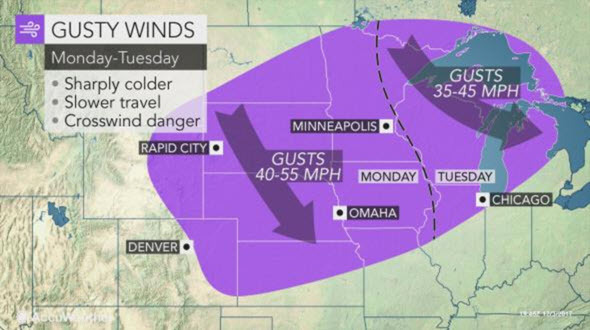 The winds are expected to gust between 40 and 55 mph across the northern and central Plains on Monday. These winds can cause power outages and tree damage. Even though snow will be falling to the north, drivers of high-profile vehicles will still have to use caution on Interstate 70 and I-80 through the Plains due to dangerous crosswinds. On Tuesday, the gusty winds will expand to the western Great Lakes where gusts of 35-45 mph are expected. Minor flight delays may result in Chicago. The winds will hold AccuWeather RealFeel® Temperatures about 20 degrees Fahrenheit below-actual temperatures. The cold may feel especially harsh to residents when compared to the highs in the 50s and 60s that will precede the storm. In Minneapolis, RealFeel temperatures will be held to the single digits throughout Tuesday. Subzero RealFeel levels will grip northern parts of Minnesota and North Dakota despite some sunshine. “This will make being outside without proper clothing dangerous,” warned Kelly. This chill is expected to challenge the low temperatures from early in November, as temperatures fall to near or below 10 F throughout the region each night this week. The cold will continue to have a firm grip on the Midwest through at least the middle of December.